I’ll start this year’s Ferriby report with a recap of last year’s (Which is probably on the website somewhere) – it bucketed down and blew a gale from leaving Barnsley to arriving at the race, which then eased off during the race before turning to snow. This year it was just freeeezing, but mercifully dry and I remembered to ignore the race HQ, 10mins jog away, and park on the road 200 yards from the finish as I had accidentally (but again mercifully) done last year. Now, I can’t understand why our favourite Dutch couple don’t do this race, as it’s got everything to make them feel at home. There a real, working windmill, and…er…Anyway, as they are (or now, were) friends of mine, that’s enough the National Stereotyping! Nice friendly race then, a not unpleasant course and worth doing if you don’t mind the drive there. Last year was a green technical t-shirt which I still wear – this year a boring white one, albeit technical, which I probably won’t. Hayho. Just two Harriers for this one, myself & John Moss. Scores on the doors: Jerry Fisher V45 150th 71.06, John Moss V50 83.26. 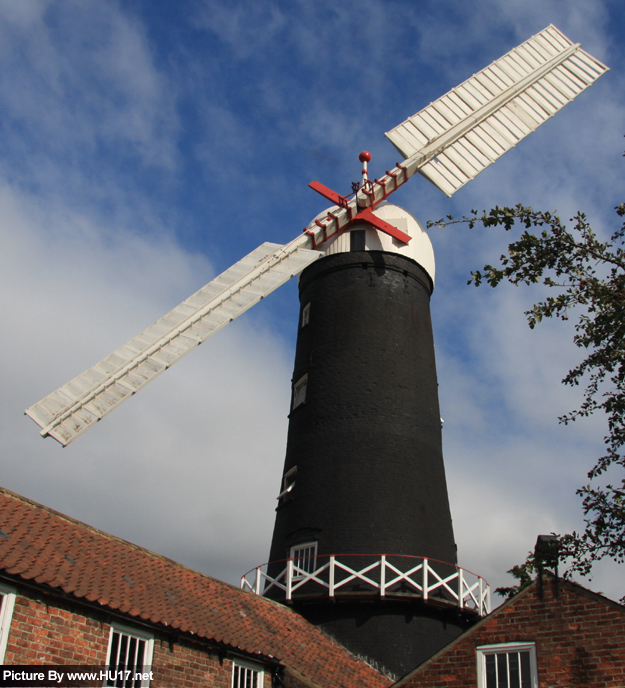 Photo: The Skidby Windmill, where, I declare, you might well find in residence a small rodent wearing wooden shoes, moving noisily between the first & second floors.